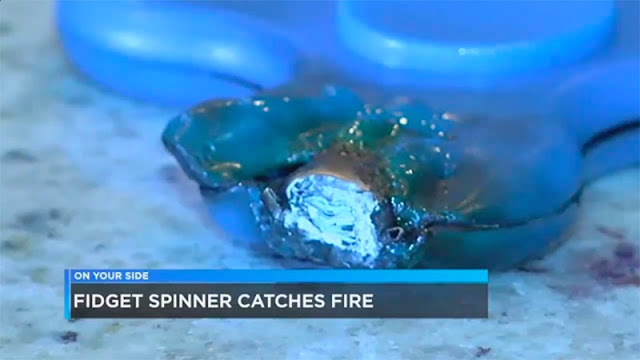 Samsung may not have entered into fidget spinners production, but there are some that seem to suffer from the same kind of problem that affected the infamous Galaxy Note 7 last year: bursting into flames as you recharge them. You'd think, how can a spinner burst into flames? Well, these aren't the plain regular spinners, but models that have inbuilt bluetooth speakers - and rechargeable batteries. It's extremely low cost may have made manufacturers opt for the cheapest batteries available (as well as charging circuits)... and now, the end result is that we have exploding spinners. If you have any such thing please stop using it (or at least, never leave it recharging out of sight). Although, if you have a LED spinner you should be safe, as those don't use rechargeable batteries (from what I've seen).